Dr. Wehking Meets Dr. Oz! 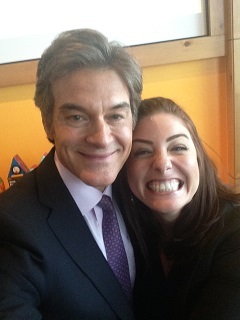 In case you can’t tell from the picture, I was pretty excited to meet Dr. Oz today. What a cool guy! I attended a lunch with about 60 other people where Dr. Oz spoke and answered questions about everything from diet soda to breast cancer to amalgam fillings. It amazed me that he remembered personal details about individuals from the audience. Did you know that in addition to being the star of his own TV show, Dr. Oz also performs 100 heart surgeries per year? This man is on fire!